Up Against it? Or, Right where they want them? The Chicago Architects are trying to win their 3rd title but are down 0-2. History tells us being down in the playoffs means very little to this team. They have rallied from 0-3 deficits before so 0-2 probably seems inconsequential, or at least it does not evoke the feeling of doom that some GM’s might feel in this position. Chi GM Al Borie had this to say this morning, “Oh, they’re off to a decent start. In their case they won’t have a chance to lose one at home until Game Six, and they may have wrapped it up by then. You gotta like their chances. But I like mine too. I have no idea who the better team is, but mine has always had a tendency to fall behind and come back.” The small sampling of 4-0 in the regular season points toward Hamilton as the favorite, especially up by two games. But, the Hamilton Mounties are all too familiar with being the last minute bridesmaid and not the bride as they, more than any other ball club, have come the closest to winning a championship only to fall just short. 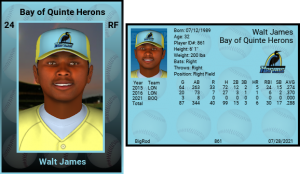 Witness last year as they took a 2 run lead into the bottom of the 9th only to see the game tied before losing in extra innings to the Duluth Sea Gulls. Hamilton has never had a losing season and this is their 4th trip to the post-season with many wondering, if not speculating, that maybe it just might be their year. The unlikely hero of game two was light hitting George Huffman batting .143 for the post season but it was the two singles in the 2nd and 4th that accounted for two runs batted in and the difference in the 3-2 win. He was but 1 for 21 heading into yesterday’s contest. The series heads to the Windy City where Arvin Northeast will take the hill while being opposed by Roosevelt Gilbert, coming off a stunning 8.1 IP shutout of Toronto. At the same time it was Arvin Northeast who slammed the door on Toledo with his 8.0 IP/ 0 Runs effort that punched the Architects ticket to the Championship Round. 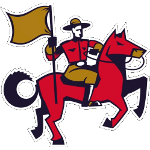 “Read the highlights and thought HAM was off to a decent start, but you’re never in trouble til you lose at home – so they say!”, were the comments of Owen Sound GM David Jones, but in the case of Chicago they not only can’t risk a loss at home but they have to win on the road. 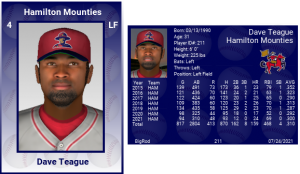 Using the above logic the Mounties simply need to take care of business in Hamilton to earn the status GLBL Champions for the first time in their history. The roadblock? Chicago loves to come from behind and is famous for crushing the dreams of their opponents. After 59 games he was hitting .395. Having played 106 games Carl is now at .396 and definitely capturing the attention of stat freaks all over the Great Lakes area. Is the 36 year old second sacker distracted with all the media attention? Who will hit the most HR’s in 2021? Tied for the league with 24 is Dave ‘Mustache’ Teague. 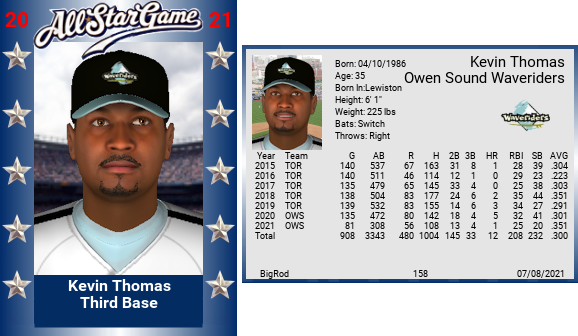 He’s been an All Star every season, won 3 Lake Erie Awards, was twice the MVP in the Canadian Playoffs, is hitting .304 with a .974 OPS, and plays three different positions. Throw in 47 BB/ 50 K ratio and you have quite an offensive force. 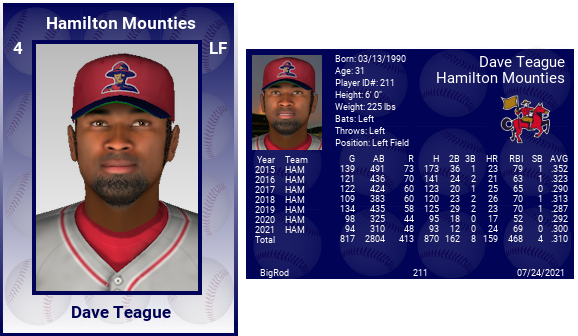 Teague has a lifetime 124 dingers and has hit less than 20 just one time. 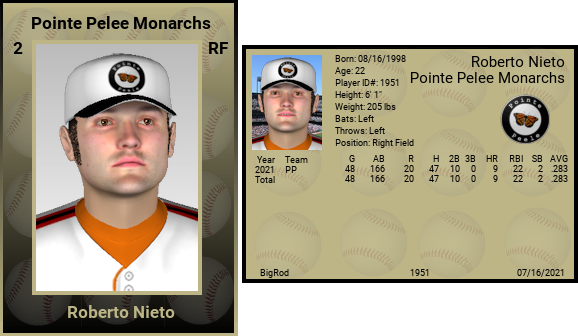 Many pick him to win the home run crown while vying for League MVP. His main competition comes from an unlikely source. Tied with 24 homers is Jim Copeland of the Kingston Comets. The Scouting Book on Copeland is that he is a not a leader, not very smart, not loyal, and has poor work habits. 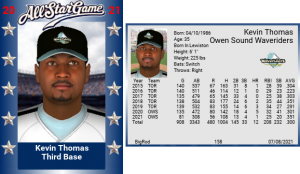 He batted .180 last season and is hitting .214 with a .262 OBP. 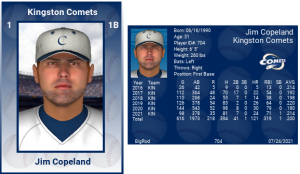 Copeland has walked 24 times and fanned 97. His WAR to date is 0.6. But, he is a masher. With 71 RBI’s to go with the 24 big flies he is on pace to hit 35 homers and bat in 104 runs. Most prognosticators don’t favor him to win any award but the reality is he can’t be ignored. 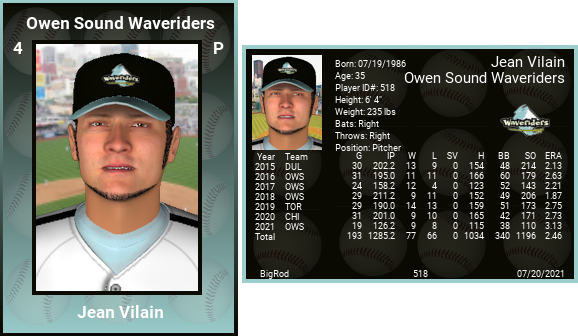 On July 16, 2021 Jean Vilain handcuffed the TC Bears striking out 11, walking but 2, and allowing 0 hits in the 2-0 No-No for the Waveriders. 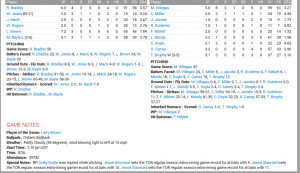 For Jean, it was deja vu all over again as two years ago, while pitching for the Toronto Maples, he shut down the Windsor Vigilantes racking up 6 K’s, yielding 2 walks, and allowing 0 in the hit column. 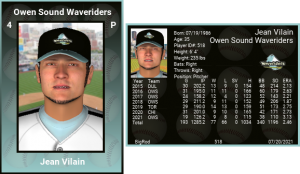 With 7 No Hitters in the 6 year history of the GLBL Vilain now owns two of them. 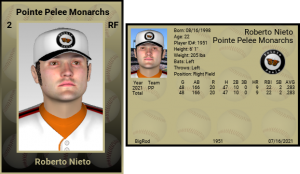 Roberto Nieto is on his way to the GLBL as the 7th overall prospect is rising through the minors at a meteoric pace. 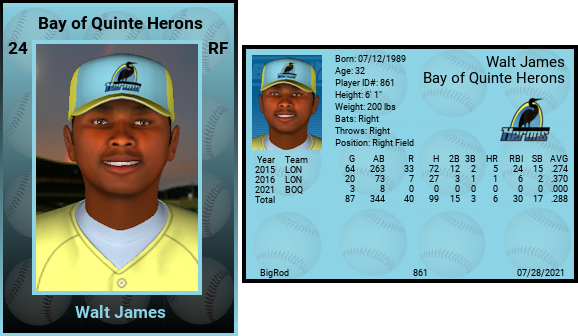 The 2021 first round 6th overall pick has already graduated from AA in half a season and is now raising eyebrows at AAA Pointe Pelee. Nine HR’s in 166 AB’s, 36/44 W/K rate, a .417 OBP. and a .506 SLG., and 2/2 stolen bases all points to a 4 tool player in the making (slow afoot). His 6 assists in the OF speak to the potential for a cannon for an arm. Look for Oakdale, Minnesota native, and graduate of Western Ontario to make his mark sooner rather later in the GLBL. Kevin ‘Wino’ Thomas at the age of 35 continues to demonstrate the ability to read the pitches and determine whether to swing or take the free pass. This year K.T. has worked the walk 48 times and fanned but 28. His lifetime BB/K ratio: 502 to 330. 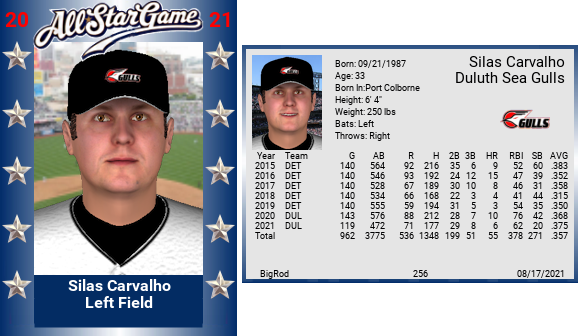 With his .351 batting average he is a force to reckon with batting out of the #2 hole. 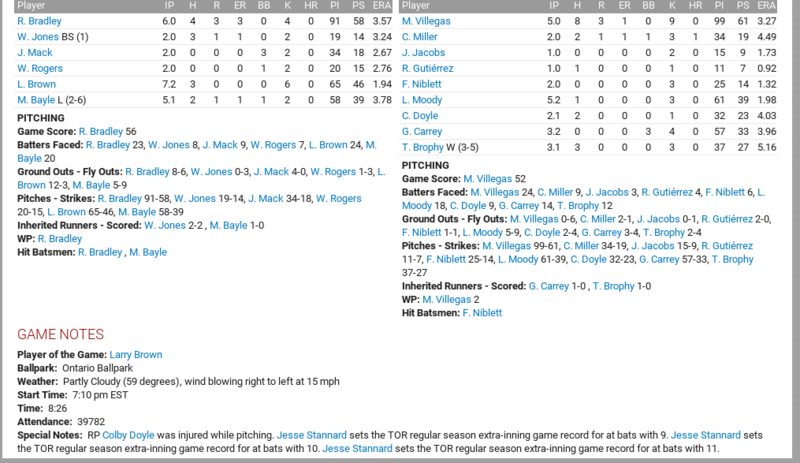 With speedster Ben Wotherspoon batting lead-off you might say the hit & run is a pretty nice option for GM David Jones.